Kendrick Kang-Joh "Ken" Jeong, M.D. (Korean: 정강조, born July 13, 1969) is an American actor, comedian and physician. He is best known for his roles as Ben Chang on the critically acclaimed NBC comedy series Community and Asian gangster Leslie Chow in The Hangover trilogy. Jeong was born in Detroit, Michigan, the son of South Korean immigrants Young and Dong-Kuen Jeong, who was a professor at North Carolina A&T State University in Greensboro, North Carolina. Jeong was raised in Greensboro and attended Walter Hines Page High School, where he took part in the High IQ team, played violin in the orchestra, and was elected to student council. He graduated at 16 and his achievements earned him Greensboro's Youth of the Year award. Jeong completed his undergraduate studies at Duke University in 1990 and obtained his M.D. degree at the University of North Carolina at Chapel Hill in 1995. Jeong completed his internal medicine residency at Ochsner Medical Center in New Orleans while developing his stand-up comedy. Jeong is licensed as a physician in the state of California. Jeong won the Big Easy Laff-Off, of which NBC president Brandon Tartikoff and The Improv founder Budd Friedman were judges, and they both urged Jeong to move to Los Angeles. Jeong began performing regularly at the Improv and Laugh Factory comedy clubs. After moving to Los Angeles, he initially practiced medicine for several years as a general practitioner at a Kaiser Permanente hospital in Woodland Hills. Jeong's background in theater and improv has led to several television appearances, including NBC's The Office, HBO's Entourage and Curb Your Enthusiasm. He made his film debut in Judd Apatow's Knocked Up as Dr. Kuni, which proved to be his breakout performance. From that point forward he was able to transition from medicine into a full-time career in the entertainment industry. Subsequently, he has appeared in Pineapple Express; Role Models as King Argotron, All About Steve; The Goods: Live Hard, Sell Hard; Couples Retreat; and as Mr. Chow in The Hangover, The Hangover Part II, and The Hangover Part III. He co-starred in Zookeeper and Transformers: Dark of the Moon, released in summer 2011. In 2007, he co-starred as Dr. Ken in Mike O'Connell's video "What's it gonna be" for the popular website, Funny or Die.com. He attacked (kayfabe) pro wrestler John Cena with a cane in the WWE Raw episode, on August 3, 2009. 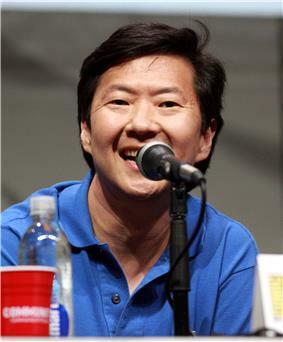 Jeong played Señor Ben Chang on NBC's sitcom, Community and was nominated for the show's "Male Breakout Star" at the 2010 Teen Choice Awards. He was nominated for two 2010 MTV Movie Awards, winning the award for Best WTF Moment and for MTV Movie Award for Best Villain for The Hangover. In fall 2010, Adidas basketball began a wide-ranging marketing campaign in which Jeong stars as the character "Slim Chin" alongside NBA stars Dwight Howard and Derrick Rose. On May 22, 2011, Jeong hosted the 2011 Billboard Music Awards in Las Vegas on ABC and was featured in a Hands Only CPR PSA campaign from the American Heart Association on June 15, 2011. He won a Streamy Award for "Best Guest Appearance" for Burning Love. Jeong will star in and produce the film The Chung Factor, which was purchased by Lionsgate on October 25, 2011. Jeong's wife, Tran Ho, is Vietnamese American, a family physician and a breast cancer survivor. They have twin daughters, Alexa and Zooey, and live in Southern California. Jeong became engaged to Ho around 2003 or 2004. Jeong was encouraged to quit his job as an internist and pursue acting full-time; Jeong states that "I had just finished filming Knocked Up, and it was life-changing. But I didn't have the courage to go for it until she persuaded me. Medicine is a hard-won skill, and acting can be a fickle profession, so I tried to be realistic. Now, I'm a spoiled actor. I get weekends off and hiatus weeks — time I never got as a doctor". He is 5' 5½" (1.66 m). 2005 Two and a Half Men Male Nurse Episode: "Woo-Hoo, a Hernia-Exam!" 2013 Turbo FAST Kim-Ly (voice) Episode: "Crazy Fast"
2014 BoJack Horseman Dr. Allen Hu (voice) Episode: "Downer Ending"
^ Ancestry.com. U.S. Public Records Index, Volume 1 [database on-line]. Provo, UT, US: Ancestry.com Operations, Inc., 2010. ^ Barshad, Amos (May 23, 2011). "The Surprisingly Earnest Ken Jeong on the Secret Messages of The Hangover". Vulture.com. ^ a b "Medical Board of California – Physician/Surgeon License". ^ a b Lopez, Robert (June 19, 2009). "Greensboro native finds funny bone in movie". News & Record. Retrieved 2010-03-22. ^ Lee, Chris (June 10, 2009). "Doctor provides best medicine". The Columbus Dispatch. Retrieved September 13, 2009. ^ "Dr. Ken Jeong". Justforlaughs. Retrieved 18 July 2013. ^ "Ken Jeong Physician License #65869". Retrieved 22 April 2014. ^ Walker, Dave (March 3, 2010). 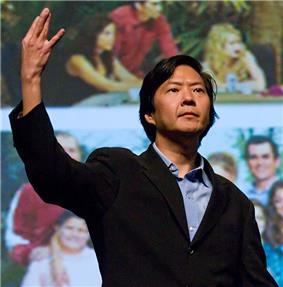 "'"Former New Orleanian Ken Jeong is getting laughs on 'Community. The Times-Picayune. New Orleans, La. Retrieved 18 July 2013. ^ "Far*East Movement will perform at Ken Jeong-hosted Billboard Music Awards". Asia Pacific Arts. May 12, 2011. ^ "Ken Jeong AHA Hands-Only CPR video". June 15, 2011. Retrieved 18 July 2013. ^ "Nominations Are Announced For 3rd Annual Streamy Awards". The Streamy Awards. 17 December 2012. Retrieved 18 July 2013. ^ Kit, Borys (5 April 2012). Community' Star Ken Jeong Joins Michael Bay's 'Pain and Gain' (Exclusive)"'". The Hollywood Reporter. Retrieved 18 July 2013. ^ Siegel, Tatiana; Belloni, Matthew (July 12, 2012). "Ken Jeong Signs on for Expanded Role in 'Hangover: Part III' (Exclusive)". The Hollywood Reporter. Retrieved September 7, 2012. ^ "Ken Jeong to star in and co-produce The Chung Factor". Asia Pacific Arts. 31 October 2011. Retrieved 18 July 2013. ^ "Jamie Foxx and Ken Jeong agree to trade movies". Los Angeles Times. 2012-10-10. Retrieved 18 July 2013. ^ Jeong, Ken (May 7, 2011). "For My Wife, in Celebration of Mother's Day". Huffington Post. ^ Deerwester, Jayme (September 3, 2009). "Ken Jeong transitions from doctor to in-demand jokester". USA Today. Retrieved 18 July 2013. ^ Margarita (June 7, 2010). "Dr. Ken Jeong Thanks Wife Dr. Tran Ho During MTV Movie Awards". Vitals. Retrieved 19 July 2013. ^ Yorio, Nicole. 's Ken Jeong You Haven't Seen"Community"A Side of . Redbook. Mike Tyson, Todd Phillips, Thailand, Kanye West, Warner Bros.